Data for a new set of telecommunications services price indexes (TSPI) are now available from the first quarter of 2014 up to and including the second quarter of 2018. The quarterly indexes measure changes over time in the prices received by telecommunications service providers for fixed telecommunications services (except Internet access), mobile telecommunications services and cable, satellite and other program distribution services. Previously, a single component of the TSPI (wired long-distance telephone services) was published, however, this series was terminated in 2005. This release marks the completion of a multi-year initiative to modernize the TSPI. The TSPI are part of Statistics Canada's suite of services producer price indexes, which measure price change at an earlier stage in the value chain process, prior to a service reaching the final consumer. Producer price indexes are primarily used by the Canadian System of Macroeconomic Accounts to deflate current dollar estimates of production into volume measures, allowing for more meaningful comparisons over time and the calculation of productivity measures. Prices for mobile telecommunications services—the largest of the telecommunications sectors—have declined by 53.6% since the first quarter of 2014. This downward trend has mainly been due to larger data allowances and increases in the quantity of cellular data transmitted by mobile subscribers. According to the 2018 Communications Monitoring Report published by the Canadian Radio-television and Telecommunications Commission (CRTC), new mobile technologies, in the form of advanced wireless networks such as Long-term Evolution, have made Internet-based services both faster and more widely available, allowing for increases in data usage. In the second quarter of 2018, the price index for mobile telecommunications services fell 6.1%, following a 10.9% decline the previous quarter. 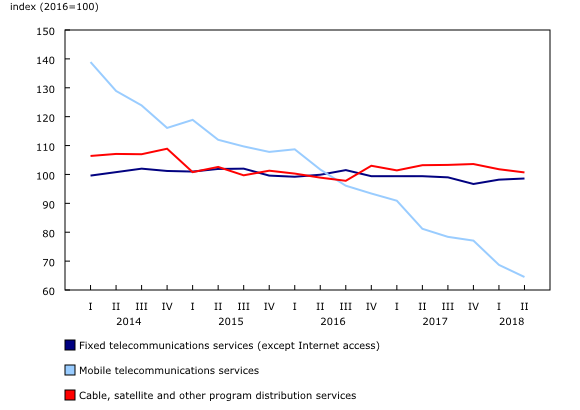 Since the series began in the first quarter of 2014, prices for fixed telecommunications services (except Internet access) have fallen by 1.0%. The Canadian landline telephone sector continues to face pressure from technological substitution such as wireless services, video calling applications, and instant messaging. According to the CRTC's 2018 Communications Monitoring Report, Voice over Internet Protocol services have also opened the landline voice market sector to new non-traditional providers. The index for fixed telecommunications services rose 0.4% in the second quarter of 2018, after increasing 1.6% the previous quarter. Prices for cable, satellite and other program distribution services declined 5.4% from the first quarter of 2014 to the second quarter of 2018. According to the CRTC's 2017 Statistical and Financial Summaries for Broadcasting Sector, this sector has been characterized by steadily declining subscriber numbers, which have decreased on average by 1.7% annually from 2013 to 2017. According to the CRTC's 2018 Communications Monitoring Report, popular online video services are providing Canadians with more choice of where, when and how to access these programs. Prices decreased by 1.1% in the second quarter of 2018, following a 1.7% decline the previous quarter. The telecommunications services price indexes measure quarterly price changes for the following telecommunications services: fixed telecommunications services (except Internet access); mobile telecommunications services; and cable, satellite and other program distribution services. The indexes are calculated using data from the Quarterly Survey of Telecommunications, which are collected jointly by the Canadian Radio-television and Telecommunications Commission of Canada and Statistics Canada. The survey collects quarterly financial and operating data for the statistical measurement and analysis of the Canadian telecommunications sector. The price index for fixed telecommunications services (except Internet access) covers both local and long-distance "landline" telephone calling services across Canada. It does not cover either Voice over Internet Protocol services or data and private line services. The prices used are the average revenue per line for local calling and the average revenue per minute for long-distance calling services. The price index for mobile telecommunications services covers mobile telephone voice (including SMS/MMS) calling services and cellular data transmission services. The prices used are the average revenue per minute for voice calling services and the average revenue per gigabyte for cellular data transmission. The prices used in this index take into account quarterly changes in mobile data usage per subscriber so that changes over time in the quality of mobile telephone services are reflected in the price index. The price index for cable, satellite and other program distribution services covers the provision of subscription television services across the country. This includes the redistribution of programming from conventional over-the-air television and radio stations. It also includes the distribution of pay audio and discretionary services (that is, pay, specialty, pay-per-view and video-on-demand services), as well as Internet Protocol television services. The prices used are the average revenue per subscriber. Beginning with the first quarter of 2015, the price index for cable, satellite and other program distribution services includes subscriptions to 'Mobile TV' services. A price index for fixed Internet access services is not available at this time. Work is ongoing to evaluate alternative data sources to properly account for changes in the quality of these services. With each release, data for the previous quarter may have been revised. Data are also subject to an annual revision with the release of second quarter data of the following reference year. The indexes are not seasonally adjusted. Data are available at the Canada level only.